But the best ones are those you make up yourself. I aspire to be what I call the Servant Queen, expressing the complementary duality of being infinitely selfless and infinitely selfish at the same time. For me, this is the true heroine, the real goddess, the most authentic person I can be. Today is my birthday, and as I enter this new year of my life, I will strive ever more to be who I am: a multifaceted soul and a servant queen. Spirit and energy are, in my view, the same concept: the verb to be. They are pure existence, which is an action and not an object, and thus neither can be observed directly. However, they can be observed and known by their effects. To be is what all things do, even if they do little else. Thus all things are spirit-infused. When we ourselves do nothing but notice that we are being, we are spending time with spirit. It is as easy as that. When we add gratitude and awe, we are giving spirit our worship and devotion. To simply be is itself a prayer when we know the true wonder of being. So the time has come for me to detox from a particularly nasty psychiatric drug with a vow to never take it again. I stopped cold turkey, and the withdrawal has been just short of excruciating. Anxiety, stomach trouble, depression, the lot. It’s been 4 days already, getting worse and only now maybe getting a bit better. I will conquer this and come back stronger. Wolf spirit is with me. 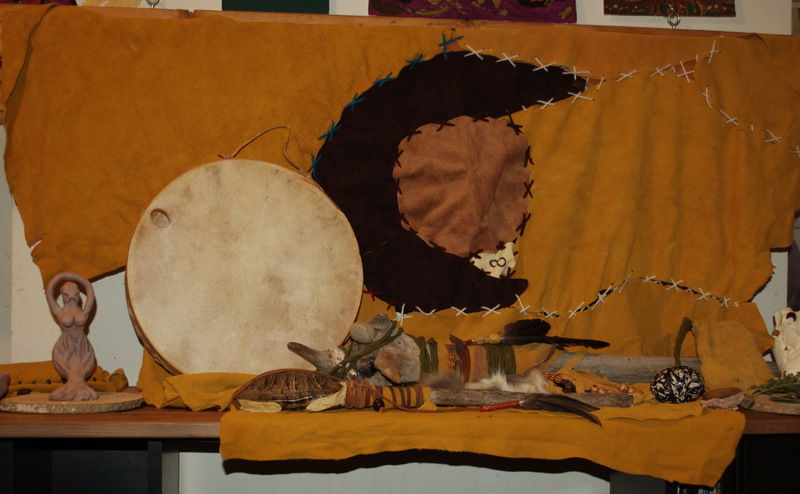 I am singing and drumming; just last week red-tailed Hawk gifted me with a feather and it now adorns my drum. I owe a LOT of people emails. If you are one of them, please be patient and I will get back to you soon. I do care about all of you and want to give you my best! Yesterday was my wife’s birthday and she bought me a present to celebrate. I now have the native drum I have been dreaming about. It has a beautiful, rich sound and I’m absolutely in love with it. I’ll be making my own drum beater in the next couple of days. The question of spiritual qualifications is often debated. I submit that spiritual training itself is not the issue: rather, the issue is with taking on a label that carries expectations one does not fulfill. Ultimately, it comes down to our general resentment towards people who overstate their own importance and make false claims in the process. It seems to me that spiritual training is only a concern when one is claiming to offer some very specific spiritual service for which standardized training has been developed and become expected. If you call your practice Reiki, then you ought to fulfill the definition of a Reiki practitioner. If the standards themselves are a little fuzzy, then you ought to fulfill the definition of your practice according to what is reasonably expected by most people seeking your help. However, if you don’t make claims to offer any specific service — if, for instance, you do not adhere to any particular spiritual label — I submit that you are free from all expectation. Furthermore, I believe that standardized spiritual training is impossible in most cases, and that reputation alone is the far better indicator for those who need proof of efficacy. There is an argument that spiritual services of any sort are powerful enough to be dangerous in the wrong hands. Therefore, one ought not offer help without training. One ought not even offer advice without learning proper counseling techniques, no matter how opinion-based and even arbitrary they may be. This boils down to the idea that no one should extend aid to someone else without being absolutely certain that one knows what one is doing. I don’t buy that. I don’t believe there is any such thing as certainty, let alone “absolute” certainty, with regard to helping people in any way. It is really far more dangerous to believe that one does know with certainty how to help. That kind of thinking is arrogance and leads to disaster. Proper humility, meaning accepting that one may make mistakes, leads to healthy caution and healthy respect for everyone involved. I really don’t mean to be dismissive of standardized spiritual training. What I dismiss is the idea that we should sit back and do nothing without it. First of all, workshops and classes are not the only ways to learn one’s practice. I’m not even sure they are the best ways, but that’s just an opinion. I think that spiritual skills by nature beg for unconventional training, which therefore cannot be standardized, and thus one cannot be expected to have followed any specific path to attain them. Ultimately, I think one ought to be clear about what service one is offering and fulfill the definition of that service with integrity. It is both our birthright and our purpose to help others — let’s not discourage it or make it more difficult than it needs to be. Imagine reaching a place in your spiritual growth when everything becomes easy. You’ve achieved peaceful enlightenment! Or, not. Chances are these “highs” have been terrible times in your life. Times when you felt bored, passionless, lethargic and desperate for a spiritual fix. This is what happens when the your spiritual path becomes too easy, too familiar. If you were playing a video game, would you appreciate it if the final 5 levels were as easy as the first? Or would it seem like a let down, too boring, not worth your time? Every time you hit a spiritual high, the satisfaction peaks for a while — and then drops. You probably think you fell off your path. You didn’t. You didn’t even plateau. You just got used to the incline. Your life’s purpose isn’t a goal you can reach. It’s not a state you can maintain. It’s the constant call to keep challenging yourself. Ultimately, if you’re following a path, that means you’re not creating it. You can’t do much to challenge yourself here but wait or take a detour to different ground. However, if you’re creating your path, rejoice in these seemingly passionless times. They are true victories. They are those moments when everything becomes easy. Now you know you can create an even more challenging journey.